Or maybe you dream about unique dice for your own game? 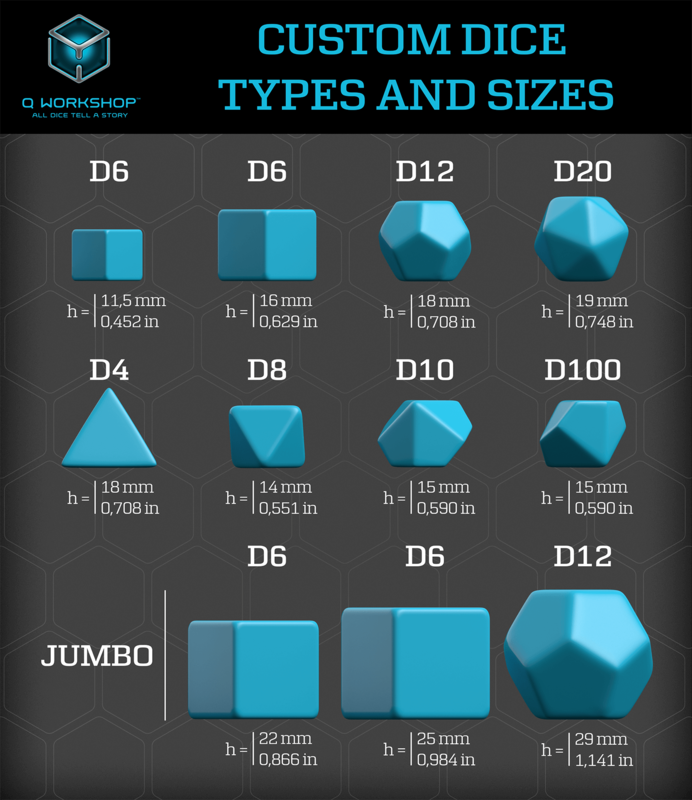 Q WORKSHOP has been the first company to offer customization of dice to a wider group of customers. We can manufacture mass quantity of dice as well as small batches. To learn more about how the finest custom dice may look like, take a look at the photos above. If you do not know it exactly, please give us the estimation. We need to know the approximate quantity, as there is a huge difference for pricing between 50 and 5000 pieces. - preparing a complicated design from scratch will be subject of additional fee. Estimated production time frames are presented in the next section of the website. The country of billing and shipping is important to us to estimate the shipping costs. Other costs, such as custom fees, may apply as well. We start counting production time once the final design is accepted and we have the payment confirmed. All our dice are engraved, not printed. We offer only solid background colors. 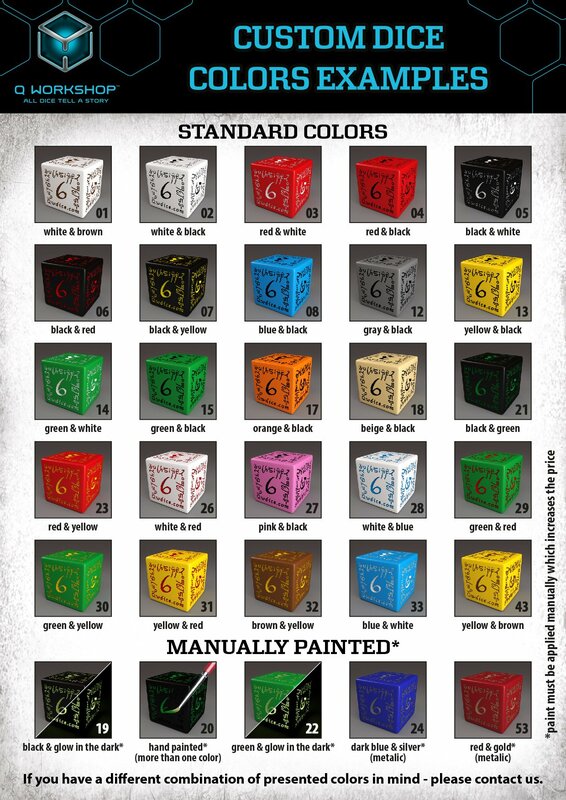 (No multicolor dice are possible). We do not make precision dice, i.e. perfectly balanced dice. Due to the intricacy of design, some imperfections in balance are allowed. For legal reasons we cannot make any dice that include a graphic motive used in any game that you are neither the author, producer, nor editor of, i.e. you do not own the copyright. The price does not include the shipping cost. ATTENTION: Each design is priced separately. If you want to order 200 dice, out of which 100 are different in design that the other 100, we will present you the pricing for 2 x 100 dice, not for two hundred. Please always inform how many different designs, and how many different color schemes does the project involve.